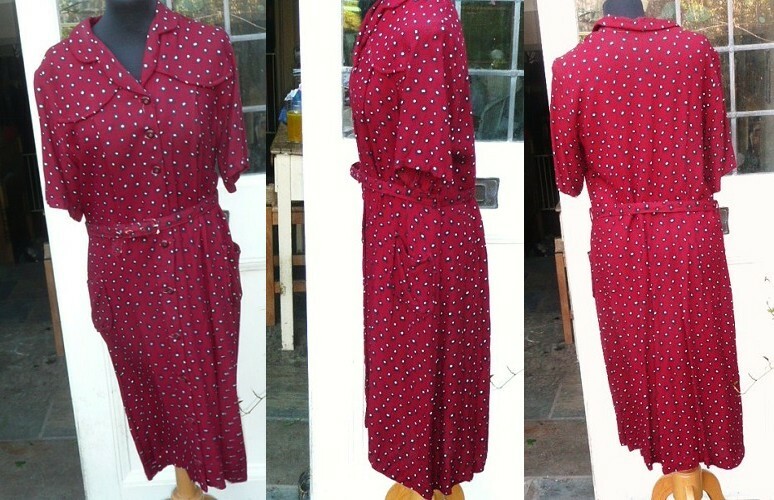 Vintage 1930s dark red button-through dress . The pattern on this dress reminds me of my grandfather's dressing gown, except that was silk and this is made from a thick, soft fabric (wool mix? ): a dark, rich red ground is scattered with irregular square and oblong shapes in navy blue with white centres. This is an everyday, not best dress, and has been well worn and frequently (very neatly)mended: the belt is very tatty (but it is surprising it has survived, and I have only kept it for the sake of integrity), there are one or two small darned areas, and the button holes and both sides of the collar have received attention. However, most of this would be hidden by a wide white or navy belt; and in its present condition it is perfect for re-enactors or amateur dramatics! Although its age and repairs give it a 'home made' feel, this has a label, reading 'Dorothy Ward LTD'; I assume this refers to a professional dress maker, particularly as this is a larger size: I reckon that in its time, it would have been about a size 28! It's simply cut, buttoning all the way down the front (with a supplementary poppa at the waist, under the belt), short sleeves, two pockets, and a pretty rounded collar with lapels and yoke. Contemporaneously, this would have been a large size: but then, this was a time when knitting patterns for a 34-inch bust were sold as 'for the fuller figure'!.. Approximate garment measurements are, bust, measured under the arms, 42 inches (106.5 cms); waist, measured at the belt loops, 38 inches (96 cms); hips, 54 inches (137 cms); and length from back of neck, 43½ inches (110 cms). These are the measurements of the frock, not the person it will fit, remember; and please do look carefully at all the pictures, as I have tried to show the condition of this item as clearly as possible.